World's largest LED TV goes on sale for £12,000 | What Hi-Fi? Sharp's 90in LC-90LE757 TV – the world's largest LED TV – will cost you £12k, but where's the 4K Ultra HD resolution? Sharp has announced that the world's largest LED TV is now on sale. The 90in LC-90LE757 stands over 1.2 metres high and comes with a suitably hefty £12,000 price tag. The AQUOS LED TV uses Sharp's XGEN 3D panel and settles for a Full HD resolution – no sign of 4K TV here. Coming with an aluminium finish and smart design, the TV weighs a whopping 64kg. It can however still be wall-mounted, though finding a wall big enough might be a challenge. The 90in screen also comes with Active Motion 200Hz motion processing technology, smart functions through Sharp's AQUOS NET+ platform, and smartphone integration thanks to Sharp's AQUOS Remote Lite App. There's a built-in triple HD tuner and media player allowing for playing music and videos and displaying photos from USB sticks or your home network. Alberico Lissoni, VP consumer Electronics for Sharp, says: "If you want the biggest and best TV, this is what you've been waiting for. It simply has to be seen to be believed and provides an experience so immersive, you get completely absorbed by whatever you are watching. 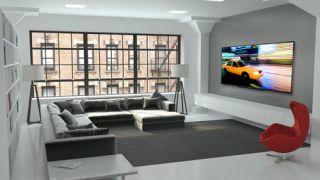 "We have created a premium design that is light and slim to fit into as many homes as possible. Remember, you can sit as close as 3.5 meters and see colours burst out of the screen, with incredible detail that's as large as life." Is bigger better? Would you want a 90in TV without 4K? Or would you rather just get yourself a projector?